WestJet is proudly showing off its first Boeing 737 MAX 8 aircraft, one of 50 scheduled to arrive over the next 10 years. The aircraft, which has been at WS's Calgary hangar since 29SEPT for inspections, training and test flights, is the first of 50 Boeing 737 Max scheduled to be delivered through 2027. It is expected to officially enter service on 9NOV, when it operates from YYC to YYZ. The Boeing 737 MAX is powered by CFM International's LEAP-1B engines, designed for fuel efficiency and noise reduction. Overall, the aircraft stakes a claim to being 14% more fuel-efficient than current 737 Next-Generations and has a reduced operational noise footprint of up to 40% through quiet-engine technology. WestJet's 737 MAX 8 aircraft feature a single cabin with 174 seats. 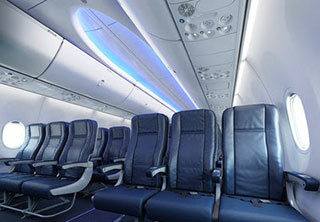 Its seating configuration consists of three rows of Plus in addition to 11 more rows with a seat pitch of 34 inches. The aircraft comes with Boeing's new Sky Interior which has features such as customizable LED lighting and new speakers to improve sound and clarity of onboard announcements. The current WS fleet consists of 117 Boeing Next-Generation 737s, four Boeing 767s and 42 Bombardier Q400 NextGen aircraft. WestJet has also entered into a definitive purchase agreement for 10 Boeing 787-9 Dreamliners with the first aircraft expected to be delivered in JAN 2019.